The following excerpts are from Harald Bode’s large collection of audio tape recordings. They date from as early as 1949 and continue through to the mid-1980s. The body of recordings includes instrument samples, demonstrations and Harald’s original compositions. Three of the few existing manuscripts Harald Bode completed are included at the end of this article. In a way similar to other inventor / musician / composers, such as Max Mathews and Hugh Le Caine, Bode’s pieces employing his own instruments and inventions are a mixture of composition and demonstration, or “proof of concept”. This later stage in the development of an instrument allows the composer to provide musical examples of some of the capabilities of their invention / development. With each example I have provided a simplified description based entirely on listening to the piece, and some knowledge of the equipment that he may have been using. It appears that most of the examples are somewhat of the nature of proof of concept, rather than compositions, or even compositional studies. While inventive and demonstrating a range of possibilities, they are largely aimed at an “average listener” rather than trained electronic music composers. The composer will have to abstractly extrapolate aspects of the equipment for more “modern” uses. Proof-of-concept examples tend to accept many limitations as “given”. 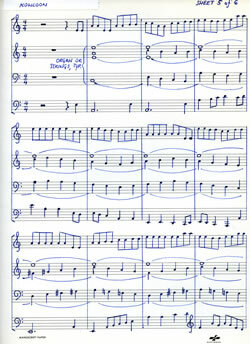 In these examples, there is not in general a wide variety of registers (except in the untitled eighth example, Audio 8), tone colour, textures, gestures or dynamics. At the time of their creation, for many potential users, the new sounds and manipulation possibilities were enough to keep them busy for many weeks or months as they would try to find ways to explore and incorporate these “new[er]” sounds and technical possibilities. 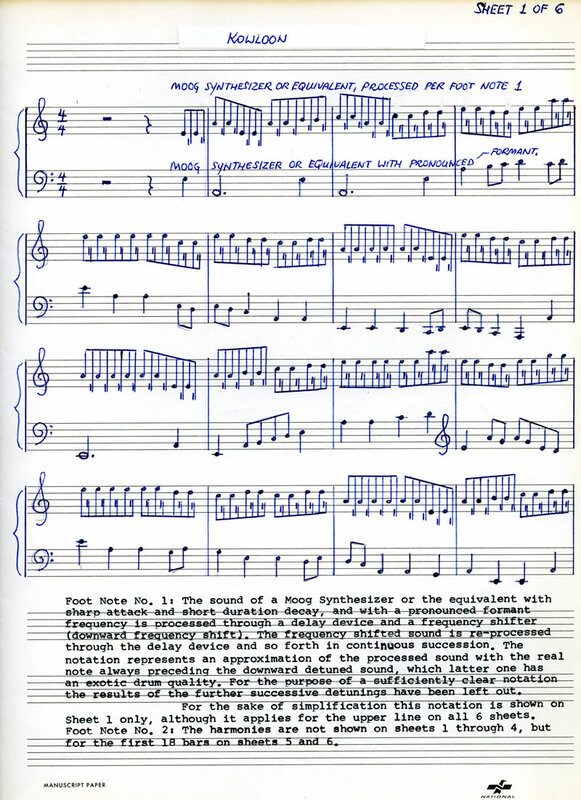 While some of Bode’s inventions and designs were aimed at the “electronic music studio”, the examples show that there was clearly an eye (and ear) open for commercial recording studio exploitation. Such commercial adoption would cover the research costs, and return enough profit (and impetus) for further inventions and developments. The term “filter” used in these brief descriptions could refer to any number of spectral effects processors, including standard multi-mode filters, phase / flange devices, and even possibly the vocoder etc. Most of the examples appear to have been recorded on multi-track tape (up to 4 channels possibly), and incorporate standard analog / tape practices including (head) echo, and reverb etc. Some appear to be driven / controlled by some form of clock or sequencer. The descriptions assume some kind of keyboard control of analog modules / patches. One of the more “experimental” examples in some ways as it is short, and with a simple fade out at the end. It appears to employ the frequency shifter on a rather complex ostinato-type rhythm in the accompaniment. 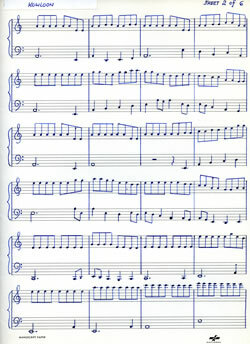 The melody includes a number of studio effects, and is created using a rather simple waveshape, controlled by both stepped and glissando keyboard notes. The title Bell Zither may be an attempt to provide a connection between the new sounds created by the technology, and a point of reference for the average listener. Audio 1 (1:09). Harald Bode — Bell Zither. 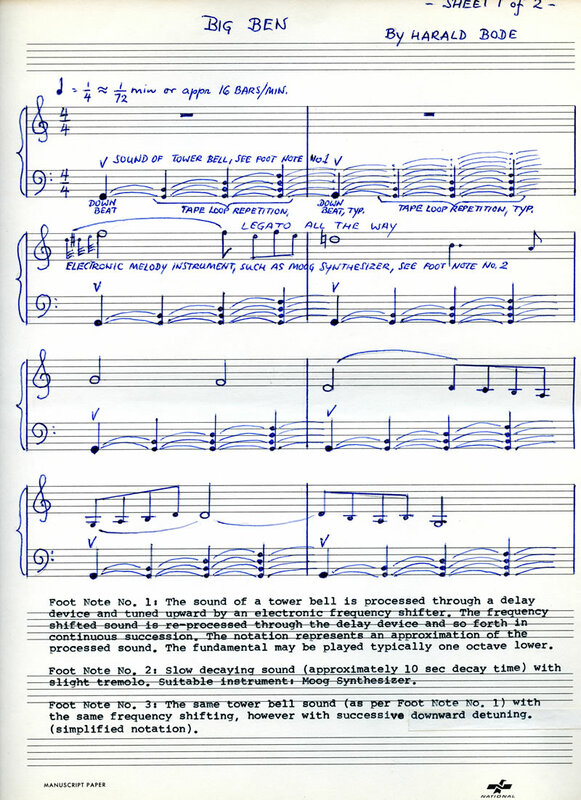 Varying clock rates in the first of this three section piece demonstrate aspects of the separation of sonic parameters that equipment developments in this period were involved with. The basic concept of synthesis was that the different parameters of a sound could be isolated and transformed independently of each other. Formants are prominent frequencies or frequency bands that characterize aspects of tone colour. Vowels for example are differentiated not by their fundamental frequency, nor by their frequency components, but by the relative amplitude of these components (partials). “Filters” (which include phase / flangers etc.) alter the relative amplitudes of these partials. 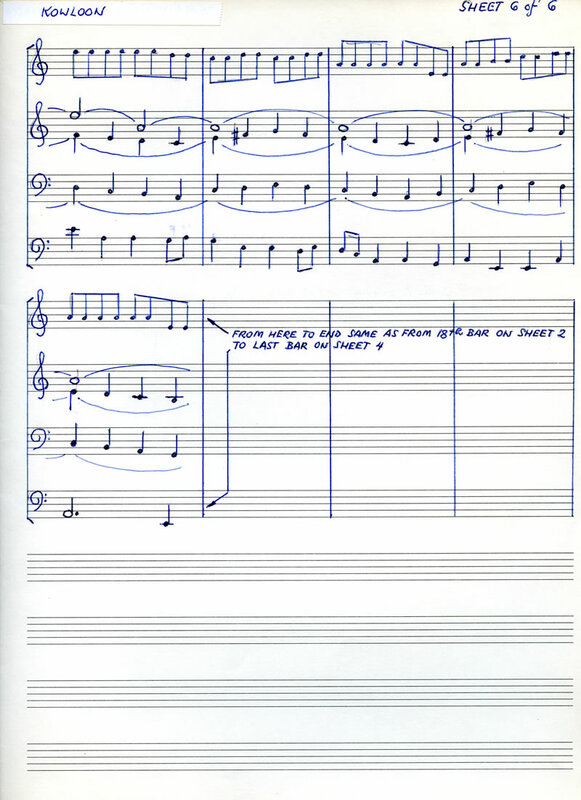 As in most of Bode’s pieces, this is a multi-layered studio composition with a number of basic studio effects as detailed in the introductory paragraphs. The first section is based on a sample/hold type patch, possibly employing an 8 or 16-step sequencer for the basic pattern of control voltages. Frequency and spectral changes are dominant aspects of the colour, made somewhat more brilliant by the echo and reverb effects. With a thunderclap, the second section begins just over one-third of the way through. This part has a drone to filter layer, enveloped noise through a bandpass “filter”, and a stepped sequencer controlling its cut-off frequency / spectrum (quasi-formant structure). 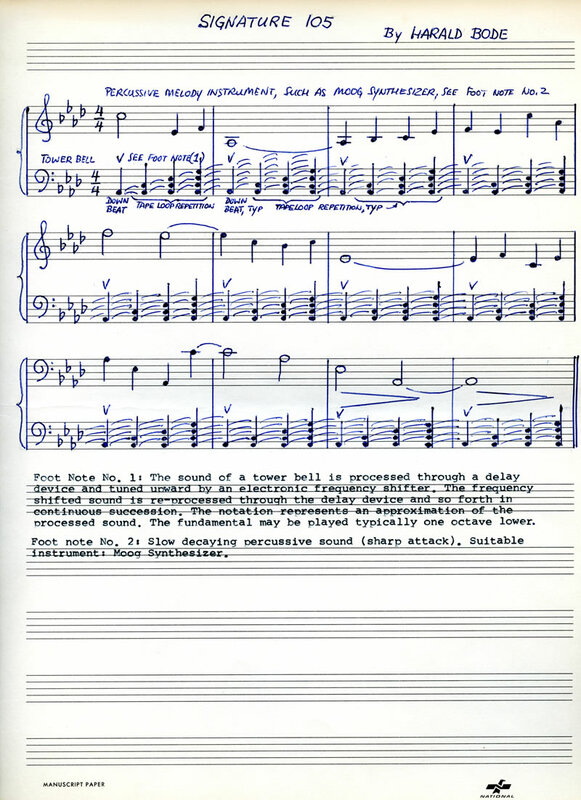 The third and final upbeat section employs a sequence / loop and incorporates pitch shifting / frequency and ring modulation to provide more complex spectra. The example fades out. Audio 2 (3:31). Harald Bode — Formant Spiels 1 & 2. A happy melody with bouncy chordal accompaniment; standard tape echo / delay / reverb effects are added to give a happy sentiment to this tune. 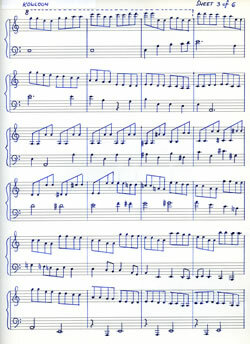 Behind this façade, the piece is a subtle demonstration in the use of filters, within each note, note by note and over phrase-length sections for strong musical effect. 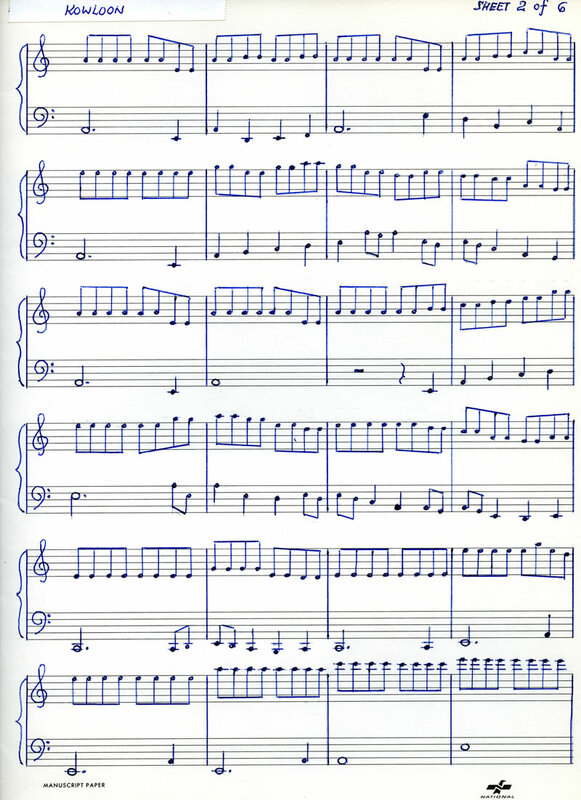 The melody emulates aspects of a vocal style by employing a (fixed) glissando (time). As clearly heard in the first bridge, the portamento control voltage for the oscillator is also available to the filters. Audio 3 (2:55). Harald Bode — Happy 2. 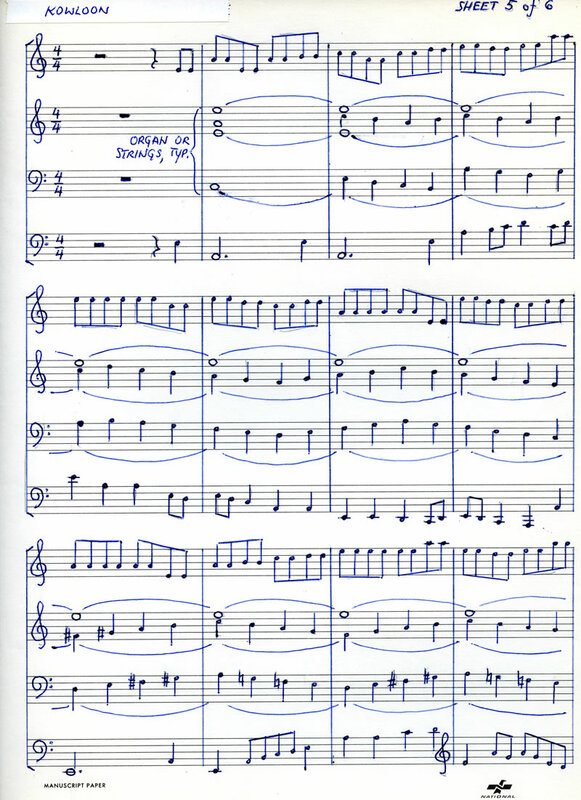 This is a longer composition with melody and accompaniment over fixed ostinato structure in the “bass”. The language is somewhat reminiscent of Kraftwerk. 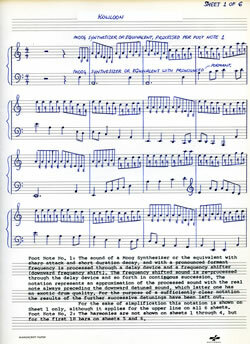 The layers are “fattened”, a characteristic of the high-quality phase / flanger that Bode designed. The underlying ostinati are also treated with strongly variant formant filter effects. In combining these devices, Bode’s composition demonstrates his instruments’ ability at basic vocal emulation, and an idea that comes from the realm of vocal groups, such as the Beach Boys, and becomes a dominant market force with groups such as ABBA. Audio 4 (7:41). Harald Bode — More with 2 Barberpoles. 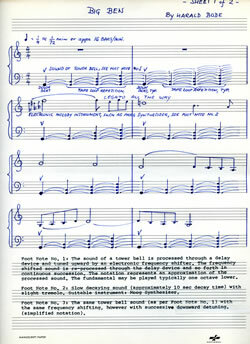 The title denotes several meanings of the word “phase” as it is used in this composition in its acoustic sense of “phase of the signal” — which will change the spectrum of the sound, and in the 1970s style of phase music where a number of layers of musical elements are repeated, but being of different lengths they do not return in the same relationship to each other. 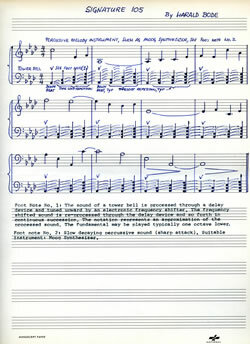 This composition is also a demonstration of pitch-shifting with feedback, complex spectra generation (possibly some form of ring modulation), with “filtering”. There are several moments of inharmonic spectra in inner parts derived from more prominent lines. As previous, “tape studio-type effects” are found throughout. As is fitting, the piece fades out. Audio 5 (4:04). Harald Bode — Phase 4-2. 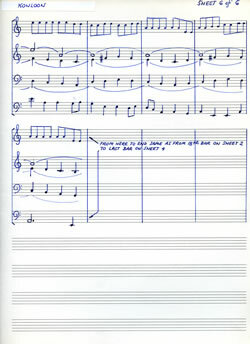 A long suite-like work in several clear sections demonstrating some specific capabilities of the equipment employing a slightly extended, but non-threatening (tonal) musical language. Beneath the rather prominent front, pulsed layer, there are some amusing glissandi with delay and channel exchange. Growl-like moments also begin to appear underneath, leading to a rapid acceleration of the pulsed layer, and a shift of focus from foreground to streamed middle-ground listening. Just after 4:00, a middle section appears to be in non-12-tone equal temperament, and using pitch-shifting for spectral complexity. A bouncy rhythmic ostinato is established (with some subtle sonic artefacts) and then enters the slightly distant melody. 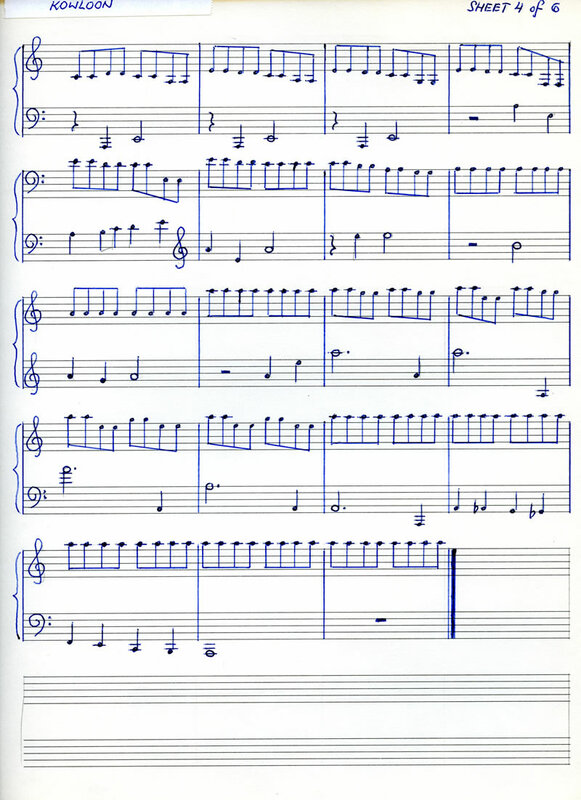 Many of the melody notes have small FM complexes added to their attacks, further demonstrating some of the subtle complexities possible with these instruments. The metric structure shifts while the pulses remains constant, and the melody slowly moves to the background with glissandi and effects. Once again, the rhythmic ostinato speeds up to audio rates and the relationships between the layers is obscured just before the fade out of this section. The third section (at about 9:00) starts with a frequency-shifted (FM quality) ostinato and a melody, which evolve into a rhythmically more complex section where the individual layers seem to be largely following their own tempo maps. There is a continued dis-integration as the multiple tempi move further and further apart, speeding up until the inevitable collapse around 13:40. The next shorter section is with the melody (and ubiquitous cross-channel delay) being played with a sustained “warbling-type” voice — with glissando. This proceeds with a very quiet, somewhat percussive inharmonic quasi-ostinato accompaniment. The final section is at a slower, more contemplative tempo — a somewhat more “spooky / mysterious” part. This is reinforced by the gentle introduction of inharmonic, frequency shifted, “bitonal” and glissando-like elements. The metric relationships between the melody and the ostinato-like accompaniment are often obscure. They slowly start to fade, but there is a final note to the piece. Audio 6 (19:59). Harald Bode — Phase 6. 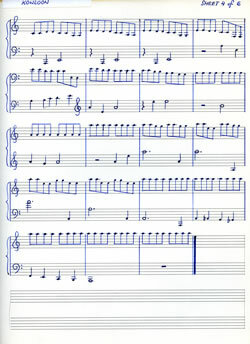 Built over a pulse, in two or three layers, this melody does explore frequencies outside of the middle three octaves of the keyboard. There is subtle integration of continuous contrapuntal activity that causes fluid shifts in the perception of exactly which is foreground, and which accompaniment. Just before 2:00, the upward chromatic motion sets up the rather unusual short bridge passage that leads back to a fading codetta. Audio 7 (2:50). Harald Bode — Rainbow Suite. A very lo-fi example that appears to prominently feature a phasing device in the accompaniment of the middle section (2:40 and on). Ideas found more fully developed in other pieces appear from time to time. Starting around 5:00 there is a more majestic chordal part to the “study” with extensive use of pulsed filters, and sustained formant structures implying choirs and bells. A final version of this composition may exist and this low audio quality recording implies that it would be worth finding. Audio 8 (6:55). Harald Bode — Untitled. A pleasant lyrical tune used as a proof of concept basic demonstration of a vocoder, oscillators controlled by a multi-octave keyboard, with spectral transformation by note-based envelopes, and Bode speaking. This has the quality of a study with the aspects of improvisation, flexibility of rhythm and consideration, predictability and the unexpected following each other freely. Audio 9 (2:59). Harald Bode — Untitled (Vocoder). 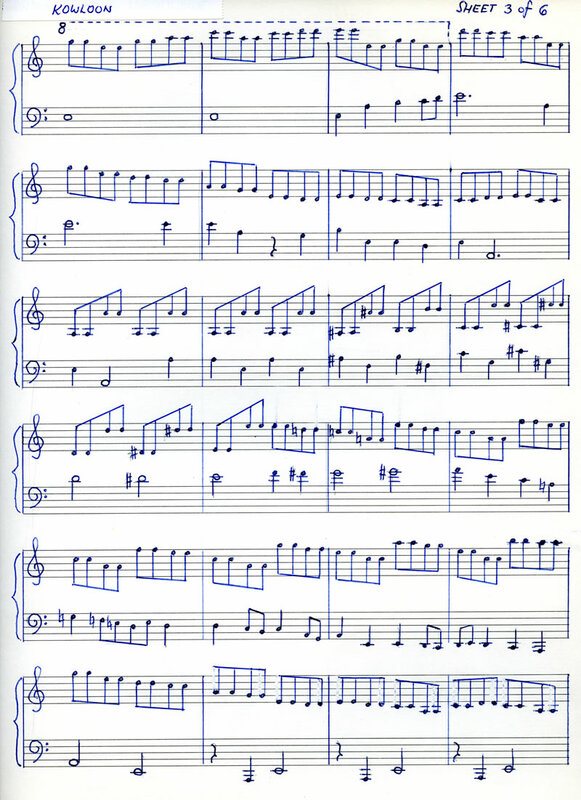 Due to the similarity in hand-writing, rhythmic character instruments suggested for the performance of these three pieces and processing applied, we might assume that they were composed around the same time, and were perhaps even intended to be performed as a group. The exact date the compositions were completed, however, is unknown.